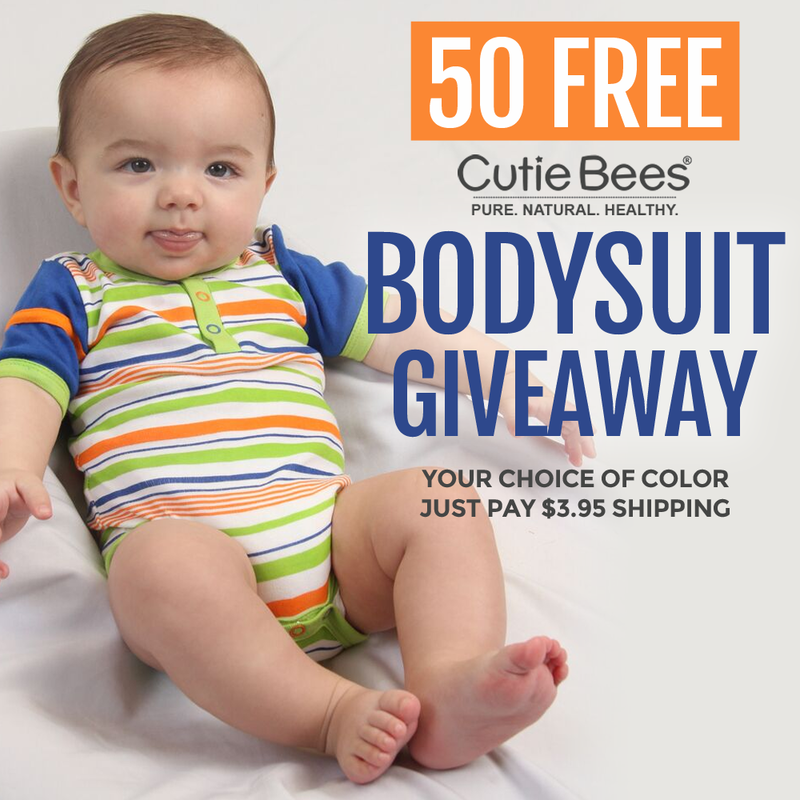 The Cutie Bees brand of healthy, non-toxic apparel for baby and kids is giving away 50 of their adorable, organic bodysuits for babies and toddlers! From February 1st through February 7th, the first 50 people to sign up will win a *free organic bodysuit – a $20 value! The bodysuit gift will be randomly selected from an assortment of gender-neutral styles. Choose from sizes 0-24 months. *$3.95 shipping charge applies. The Cutie Bees bodysuit helps you ditch toxins with every use, so you can dress your baby in style without worrying about harming your baby or the planet! The one-piece suit won’t come untucked so it stays neat on your wiggling cutie. It stretches gently (a must for diapers!) and springs back to shape with each and every wash. In true Cutie Bees style, this super soft bodysuit fits well over diapers, uses non-toxic water based dyes, and is the only bodysuit you’ll want to use over and over again. Cutie Bees baby clothes are healthy and non-toxic, so you never have to worry about the harmful chemicals hiding in your baby’s clothing. These clothes are made from 100% certified organic cotton and are hand finished without any harmful chemicals. Cutie Bees follows strict procedures and inspections throughout the entire process. And, they even test their products to ensure no harmful chemicals were found in Cutie Bees baby clothes before they are sold.